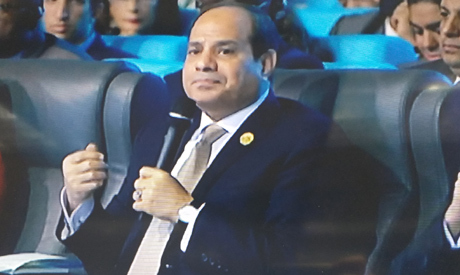 Egyptian President Abdel Fattah El-Sisi during first panel of the first day at the World Youth Forum on Sunday. “We in Egypt do not discriminate, we do not say ‘this is a Muslim and this is a Christian’; we say we are Egyptians,” the president said in a speech. On Friday, gunmen opened fire on a bus carrying Coptic Christians on their way back from visiting a monastery in Minya, leaving seven dead and at least 10 injured. The president also highlighted the importance of “reforming religious discourse,” which he said “is one of the most important demands of Egypt and the world." El-Sisi also highlighted that Egypt passed a long-awaited law in 2016 easing regulations on building churches, and stressed the importance of freedom of belief for all citizens in Egypt. “The country has been keen on building churches in new and old cities, and even [places of worship] for other religions, for Jewish citizens,” he said.